Inform your internet and telephone service providers of your move to ensure they can transfer your services on time. Contact all other supply contracts, leases, and service providers to inform them of your move. 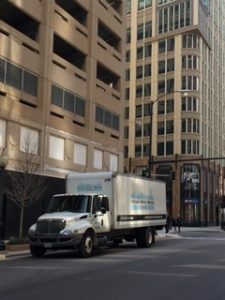 Speak with either your current and future landlord or building manager to find out about restrictions for the move, such as usage of elevator/docks/alleys and what times the moves can be conducted. Prepare an inventory of the items to be moved. Decide if you want to move items or if you'll be replacing them at your new location. Contact a relocation company. The sooner you choose your relocation provider, the more likely you'll be able to move on the day(s) you will be requesting. Ideally, you should contact them two to three months before your move. Break it down into small, manageable tasks so that everything gets done. Set the guidelines for your relocation schedule. Are there restrictions your landlord or building manager has put in place for the move? Do you require building protection on moving day? Make sure they are noted. Discuss the arrangements you've made for other contractors for moving day, such as photocopier and IT contractors or staff. Arrange a meeting with your IT department and relocation consultant to discuss and agree the special needs of the IT relocation schedule. Find out from your building the insurance requirements for the relocation. Arrange for secure destruction of old items. Take an inventory of all items to be moved. Determine if your old furniture will be moved to your new location. 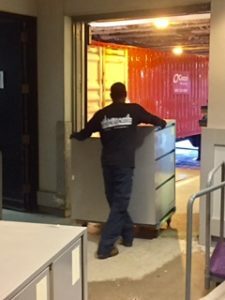 Do you have new furniture coming into your new location? Discuss the inventory with your relocation company. Arrange for archive storage of the documents. The less you move, the less your move will cost! 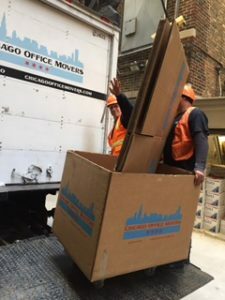 Allocate specific jobs to individual employees who are helping with the move. Brief them about their responsibilities. Check with personnel to confirm they've cleared all unwanted and unnecessary documents. Confirm with your current and future landlord or building manager any policies or procedures which may affect the relocation schedule on your move date. Inform neighboring businesses in both your current and new premises of the move. Inform your suppliers, customers and contacts of your new address. Arrange for your website to be updated with the new address at the time of your move. Organize employees to take responsibility for common areas. Point of Contact emergency telephone numbers and info for all vendors associated. Designate an area at your new premises for the placement of un-labeled crates and equipment. Determine which employees will not be in work at the time of relocation, and arrange for someone else to take responsibility for the correct relocation of the absent employee's belongings. Take delivery of relocation crates, labels and other moving equipment. Ensure every item being relocated is labeled according to the guidelines given to you. Meet with your relocation consultant to finalize the plan for moving day. Provide your relocation consultant with a detailed floor plan. Confirm the move schedule with employees who will be present on moving day. Walk through the new premises with all involved in the move Moving Day. Ensure all employees are undertaking their assigned tasks. Have a complete and thorough inspection of the old site with the move manager to ensure all labeled items have been relocated. Visit your new site and ensure everything has been delivered and placed correctly. Gather all crates to ensure the number of crates you're returning is the same as the number delivered. Contact your relocation coordinator to organize the collection of crates.